About two years back I watched a Ted Talk by Christopher Bell called ‘Bring on the female superheroes’. It left me stunned. It argues that the position of women in our society is less social conditioning but more a capitalist agenda. And who has ever won that fight? It was so demotivating. You can change a regressive government by voting them out of power but how do you fight the entire machinery of commerce that wants to make sure women ‘stay in their place’ so they can continue to profit from it. If it seems far-fetched, I invite you to watch that talk (it’s one of the most powerful talks and not a rant). I remember, it stayed with me for many days and it was one of the major reasons that I decided to aggressively sensitise my son to gender equality. And, as is the case with many such things, once you know you have done your bit, you move on. A few weeks back I took Kabir to watch Black Panther. The story of the film is much the same as any other superhero film, bad guy is stronger but the good guy wins on the back of integrity, righteousness and love. Oddly enough though, where I used to count the minutes to the end in such movies, I found myself oddly engrossed in the film, rooting for the good guys and even want to watch it again. While I was in the film, I couldn’t tell what it was but later I realized that it was the beautiful balance of the genders in the film that had won my heart. Each of the major female roles held their own. The film would not have work even if one of them was missing. Black Panther normalised so many things at so many levels and sent out strong messages – not preachy, not in your face, but as a matter of fact. Of course, every girl should watch this movie but boys even more so. Some of the reasons why I loved it. A lot of it won’t make sense but will hopefully make you watch the movie. 1) The movie had very strong female characters. There was no “fight like a man” or “fight like a girl” differentiation. They were physically strong, smart and intelligent just like the male characters. Nowhere, in the movie I felt any gender differences. 2) Shuri, the king’s sister, was the head of the scientific research lab breaking the biggest stereotype that there is about women and science. 3) The king wasn’t supposed to understand all about technology just because he’s a man. Shuri took advantage of that and played little pranks on him. 4) It showed the vulnerable side of humans even if you are a super human. The king isn’t shown to be beyond flaws or defeat. 5) In a lot of crucial parts, the king (Black Panther) doesn’t even feature while the women just take care of business. 6) W’Kabi who’s the leader of the border tribe (and goes against the king) eventually surrenders to Okoye. 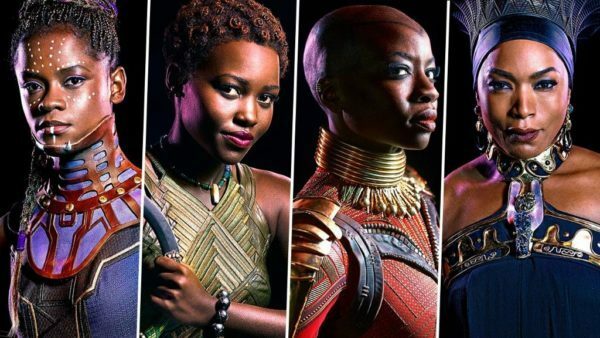 Okoye is one of the greatest warriors of Wakanda who just happens to be a woman. And nowhere will you feel gender distinction between warriors. 7) I haven’t seen a more beautiful representation of ‘strong is beautiful’. And I came back from the movie knowing I will do that strict pull up I have been wanting to because I’m not going to let the conditioning dictate me. And as far as my son is concerned, I was really happy to find him being cool about buying a pink school bag as long as it had enough space in it.